Whereas the past decades have seen a profound reconsideration of eighteenth-century visual culture, the architecture of that century has undergone little evaluation. Its study, unlike that of the early modern period or the twentieth century, has continued to use essentially the same methods and ideas over the last fifty years. 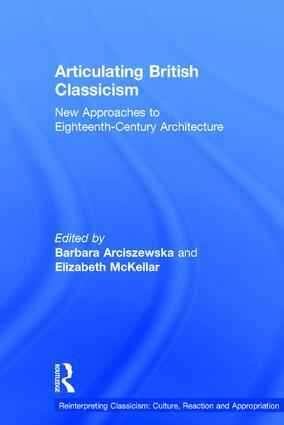 Articulating British Classicism reconsiders the traditional historiography of British eighteenth-century architecture as it was shaped after World War II, and brings together for the first time a variety of new perspectives on British classicism in the period. Drawing on current thinking about the eighteenth century from a range of disciplines, the book examines such topics as social and gender identities, colonialization and commercialization, notions of the rural, urban and suburban, as well as issues of theory and historiography. Canonical constructions of Georgian architecture are explored, including current evaluations of the continental intellectual background, the relationship with mid seventeenth-century Stuart court classicism and the development of the subject in the twentieth century. Contents: Preface; Introduction: Classicism: constructing the paradigm in Continental Europe and Britain, Barbara Arciszewska; Popularism versus professionalism: John Summerson and the 20th-century creation of the 'Georgian', Elizabeth McKellar; 'A mockery of the Surveyor's style'? : alternatives to Inigo Jones in 17th-century elite British architecture, Elizabeth V. Chew; From Burlington Gate to Billingsgate: James Ralph's attempt to impose Burlingtonian classicism as a canon of public taste, Matthew Craske; A 'Rarie-shew System of Architecture': Bath and the cultural scenography of Palladianism, Carol Watts; Commercialization and backlash in late Georgian architecture, Daniel M. Abramson; Joseph Gandy and the politics of rustic charm, Andrew Ballantyne; Negotiating classicism in 18th-century Deptford and Philadelphia, Bernard L. Herman and Peter Guillery; Architectures of confidence? : Spanish Town, Jamaica, 1655-1792, James Robertson; Select bibliography; Index. This series provides a forum for the interdisciplinary study of classicism in the arts and architecture in the Western World from the Renaissance to the present day, investigating its complex nature and development, the selection and use of ancient sources, its cultural, political or ideological role, and its relation to other existing traditions and styles. The series is inspired by recent re-examinations of the discourses of interpretation used in art history.